I can’t remember the last time I went out without my phone. I think it was in that brief period when I thought running would be fun. As many in the same like of work, I am not only attached to the device and what it can do, I’ve also become aware of it’s limitations. Especially when it comes to power. If like me you use your phone to view, create and share multimedia you’ll be lucky if your device lasts a whole day. I have a few battery back up systems I use when away from wall plugs or on the move. But I’ll save listing them for a future blog post. Right now I’d like to focus on the easiest way of getting my iPhone up to full power and that’s a mains socket. There is normally one around. I sometimes charge my devices via the solar panels on my office, but this is not practical on the road or when travelling light. It used to be I’d carry the cumbersome plug that came with my iPad. It was faster that the standard iPhone plug but was bulky and needed to be carried in a large coat pocket or a bag. Then, finally someone (a designer called Min-Kyu Choi) redesigned the UK Plug. Something I thought was long overdue. Around six years ago I saw the first sketches of the original Mu Plug and three years later, the prototype. I was super thankful when the guys at MadeInMind sent me one of the first off the production line. Since that first unboxing I have used a folding charger almost every day. It would have been the same exact one in the video if I hadn’t lost it. Luckily I was able to pick up another on sale for £9.99 in Maplin. My only frustration was that I needed a faster charger. Other’s were making them. Some even folded. But none were as compact. When I first fed back on the initial design I’m sure I asked for the same features as others. Then, a couple of weeks ago Matthew Judkins sent me the updated designs. I wasn’t disappointed. Everything I thought would make a decent upgrade had been included into the new models. The Tablet and the Duo. Me: Thanks for the updated Mu chargers. I have a few questions when you have time? Is the original charger being discontinued? MJ: Nope – we have repositioned this as the Mu Classic. It will be in 4 colours: black, white, pink and blue. Me: Are the improvements something the community suggested? MJ: Yes. One thing about getting a product out there is that you get feedback from customers and supply chain partners regarding what sells and what doesn’t. From both of these there has been a big call for a higher powered unit and a multi device unit. Me: Were the original concerns of a 2+A charger overheating unfounded? MJ: No. We test all of our products at a peak charge in an elevated ambient temperature. These products will operate perfectly well far in excess of 50 degree ambient. At an extreme scenario (in an oven) we have electronics built into the board that shuts the unit down in an overheat scenario in any case. I think we get a few comments from casual neigh sayers occasionally that haven’t actually used the product! Me: How were the new chargers received? MJ: Amazing. 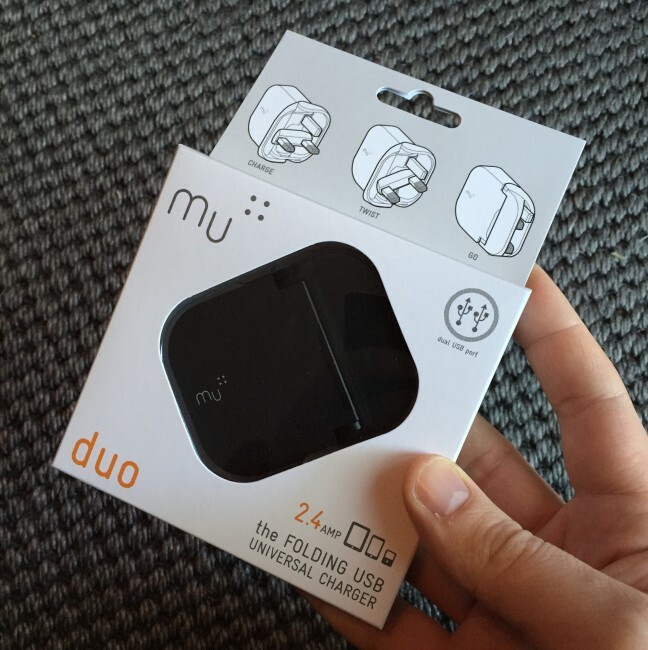 We’ve sold out of the pilot run of Mu Duo White and down to our last few on the rest. It’s likely that we will be out before our next shipment comes in. Me: What kind of people are you supplying? MJ: Just our fans at the moment. We have lots of people that follow us after the Design if The Year win (in excess of 5k on our database). These are highly engaged. Once these guys have first products we then push into mainstream retail. Me: Why have a single usb charger and a duel one? Is it a cost thing? MJ: No, it was driven by feedback. Some people want a powerful unit for tablets etc. Some want to power multiple smaller devices (a phone and an iPod). You pays your money and takes your choice. Me: What are the prices likely to be on the high street? MJ: Similar to as posted on our website for the first 500 units. Me: Do you have any side by side specs regarding charge times? MJ: No. We test lots of products to check compliance and optimum charge performance for these. We have specs for power performance of our product at peak charge which is: 12W for the tablet and 2 x 6W for the Duo. For charge times with devices there are so many device side variables (cable type, how much charge the device already has) that putting up charge times is an invitation for criticism – nobody does it! ME: Will you sell one as a standard fused household plug that will fit alongside others into a hub? MJ: No – There is not enough consumer demand to justify the development cost. I can see if being an ‘in the box’ product if a laptop manufacturer wants to license our design. Me: If you use one USB port on the duo will it deliver 12w like the single and then share that power when the other port is used? MJ: No, each port is limited to 6W each. Me: Finally does Made In Mind have an ethics policy? Working conditions, plastics used etc? MJ: We’re a little small to have a full ethics policy laid down (and more importantly implemented rather than being superficial). We are three dudes with a sketchbook! I have however put in place manufacturing arrangements with Tier 1 and 2 manufacturers that are major players in the industry. These guys are more expensive than tier 3 manufacturers, but they have in place ethics policies covering working conditions, pay and quality – and these are monitored by other companies that they supply that are much bigger than us. I’m starting to ask that last question a lot recently. It’s a small thing in the grand scheme of things. But if we shop for tech wondering if it’s ethically made, or if the company is at least trying, I’m sure we will buy less. It’s certainly no longer acceptable to design and manufacture something without considering it’s impact on the world. I was pleased to hear Made In Mind had got Mark Shayler @GreenApe to take a look at things. He pulled together a study on the environmental impact of including the Mu in with the box for UK shipments of a certain major smartphone. In summary – it would mean a huge reduction in packaging and logistics. And no doubt a huge sack of cash for Made in Mind. After a couple of weeks with both the Mu Duo and the Mu Tablet charger I’m more than happy with the way they perform. The slightly smaller classic has been demoted to emergency back up if I forget the others. There are other compact plugs on the market. I’ve just not found any that provide this much power within such a small footprint.